At the start of the year I set myself the target of seeing at least 300 bird species during 2012. The 300th bird was seen on Scilly on 13th October, but progress has been fairly slow since. On late autumn bird that I had hoped to see was Waxwing. Waxwings are irruptive, pouring into the UK when the berry crop on the Continent fails. The trouble is the berry crop seems to have failed here as well, so many flocks have moved on rapidly and hence have been untwitchable, at least here in Dorset. A small flock had been seen in the centre of Oxford at St Giles churchyard. It was only a short detour from the A34, so on our journey up to Ripon on the 1st we headed into Oxford where a single Waxwing was on show. A quick stop in Oxford produced a single Waxwing. There has been a sizable influx this year but most of those that have reached the South Coast have quickly moved on. Red Kites have been successfully introduced to several areas of Britain, they are regularly seen in the area around Oxford but we also saw one on the 1st in the Vale of York, the first time I have seen one in the north of England. 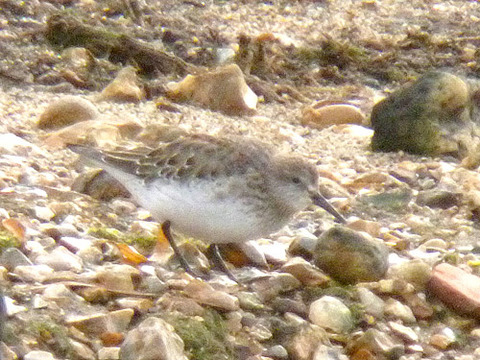 Whilst we were away in Yorkshire news came through of a White-rumped Sandpiper at Longham Lakes just outside of Poole. This species breed in arctic Canada and Alaska and winters all the way down to southernmost South America. It is a rare visitor to the UK, it is the 6th I have seen in the UK and the second in Dorset. There had been a claim on Brownsea in the summer but it had gone when I got there and further research showed that it had to be an aberrant individual or a hybrid, so I was very glad that it was still at Longham Lakes on the morning of the 3rd. Unfortunately the island on which it had taken up residence was a bit distant and my photos were useless, however Christchurch birder Alan Hayden allowed me to post one of his. The White-rumped Sandpiper was year bird number 308. There might be another major rarity before the end of the month but I don’t think that is very likely, so it probably will be the last bird of the year. If so, there is a certain poetic justice to the situation as I started the year at Longham Lakes where I saw my first rarity of 2012, a Blue-winged Teal. A visit to Holes Bay on Thursday 6th was very successful. Freezing conditions may have pushed a lot of birds off Brownsea (the lagoon was partially frozen) and Holes Bay was stacked with birds. 15 Spoonbills, over 100 Avocets plus 500+ Wigeon and Teal were just some of the birds on show, but there was a bitter eye-watering wind which made it hard to keep the scope steady. Part of the flock of 15 Spoonbills in Holes Bay. Once a local rarity, numbers have increased greatly in the last decade. These birds originate in Holland and come to Dorset for the winter. Spoonbills feed by sweeping their bills (held open) from side to side in shallow water. The flesh-coloured bill indicates that this bird is a juvenile. Juvenile birds show black tips to the primaries in flight. On 8th a group of us went to Durlston for one last ringing trip of the year. Predictably we only caught six birds but the main reason for going was to collect all the gear and put it in storage for the winter. Durlston lighthouse on a clear but cold day. This Goldfinch was one of the last birds we ringed at Durlston this year. The 2012 total was 2114 compared to 3032 in 2011. The recovery rate however remains remarkably low. The 9th was another WeBS count (only two weeks after the last, presumably to prevent us having to go out the Sunday before Christmas). Highlights in my area of Holes Bay were similar to the 6th, with the addition of a few Turnstone, a Greenshank and a Spotted Redshank. Large algal mats cover parts of Holes Bay and provide feeding areas for these Wigeon. The dark background is the railway embankment in shadow.